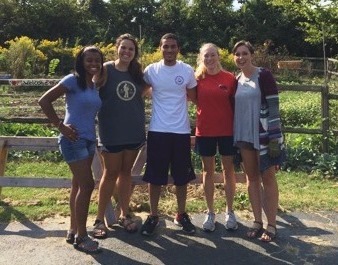 Students from Slow Food Belmont and their faculty advisor Dr. Kimberlee Daus volunteered at the Nashville Food Project on Saturday, September 19. Working with the smaller of the organization’s two gardens, students pulled weeds to save raspberry bushes and transferred compost to new beds. The Project uses food from the gardens to prepare more than 2300 meals per month for distribution. For more information on Slow Food Belmont, click here.